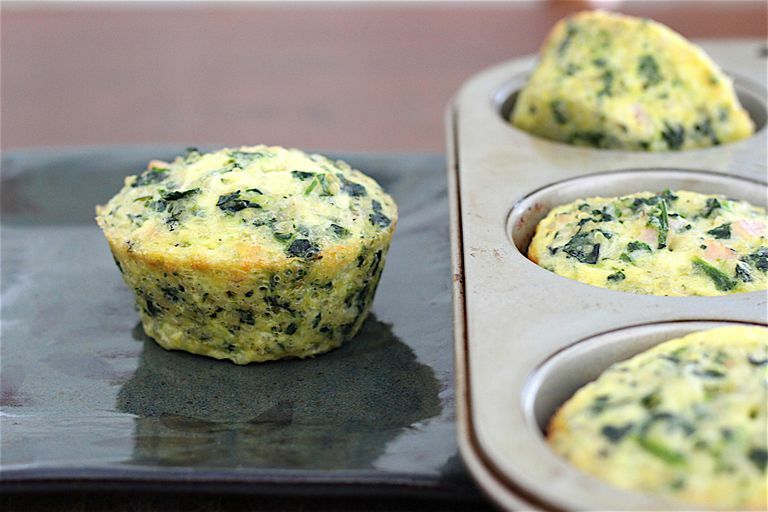 These little quiches are a healthy, filling breakfast option that can be made ahead of time. They freeze well and can be microwaved from frozen. Pop one in the microwave and breakfast is ready in about one minute. How fast is that? Use your imagination to come up with variations. Preheat the oven to 350 F. Have a 12-cup muffin tin on hand. In a small saucepan with a lid, combine quinoa and water. Cover, bring to a boil, and reduce heat to a simmer. Cook until water is mostly absorbed, 12 to 13 minutes. Remove from heat and leave covered for 3 to 4 minutes. Remove cover, fluff and let cool. While the quinoa is cooking, place the frozen spinach in a small microwave-safe bowl and cook on high power just until thawed, 1 to 1 ½ minutes. Press down on the spinach with a spoon and pour off excess liquid. Spread spinach out in the bowl to speed cooling. In a medium bowl, whisk the eggs. Add thyme, sage, salt, pepper, scallions, and whisk. Mix in cooked quinoa, Canadian bacon, spinach, and cheese. Grease 9 cups of a muffin tin very generously with baking spray or oil. Use a soup ladle or a large spoon to divide the mixture into the muffin cups, filling them to 1/8 inch below the top. Bake in the middle of the oven until quiches are set and slightly golden around edges, 18 to 20 minutes. Remove from the oven and let them cool for 10 minutes in the pan. Run a knife around the edge of each muffin cup to loosen, then serve. Use fresh baby spinach in place of frozen spinach. Microwave on high power 1 to 1 ½ minutes until wilted. Squeeze out excess water and lightly chop. Use diced ham or pancetta in place of Canadian bacon. To prevent your quiches from sticking to the muffin tin, spray the baking pan very generously with baking spray immediately before filling it. If done ahead of time, run a finger around the edges to recoat the inside of the cups before filling, as oil may settle into the bottom while you are doing the prep. Use bagged frozen chopped spinach rather than the frozen spinach blocks; this makes it easier to remove just the amount you need from the package. Freeze extra quiches on a foil-lined baking sheet. Once they're frozen, put them in an airtight container and store them in the freezer until they're needed.